The kitchen faucet is the hardest working piece of equipment in the home. From filling the kettle to rinsing vegetables, it is used throughout the day, every day. Therefore it is essential to invest in a faucet that not only looks good, but is also built to last. A kitchen faucet should be chosen for its perfect balance of design and function. It should enhance the work area and be effortless to use, even with greasy hands. 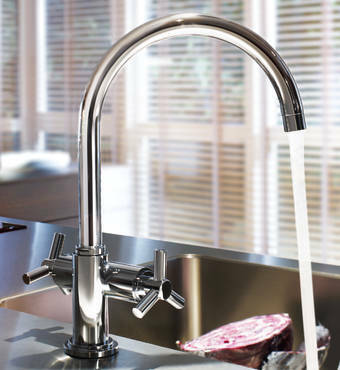 A smooth handling of the lever is very important in order to ensure a precise adjustment of water flow or temperature. For an architectural open-plan space, choose a single-lever kitchen faucet with refined lines to echo the purity of the room. For a traditional kitchen select a two-handle faucet. Keen cooks will appreciate pull-out rinsing sprays which make light work of rinsing out pots. The classic styling of two-handle faucets allows them to adapt to any kitchen environment. Mounted in a single hole in the sink or the worktop, they feature individual levers or handles to control the hot and cold water supplies. 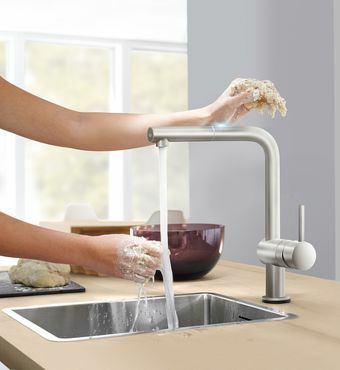 Single-lever mixer faucets enable you to control the water flow and temperature with one hand. Ceramic discs in the faucet cartridge allow fingertip control of the water mix, leaving your other hand free to use the rinsing spray. Levers can either be mounted on the top or at the side of the faucet body. Stainless steel and chrome faucets complement all style of kitchens. Sparkling chrome will add a highlight to the kitchen area and enhances the look of composite work surfaces and sinks. Stainless steel, a material known for its anti-bacterial qualities, gives a professional look. Look out for a solid metal faucet body with ceramic discs in the cartridge for smooth easy-to-use actuation. A quality faucet will last a lifetime so select a design with timeless appeal. It is false economy to buy a cheap faucet, as you will only have to replace it a few years time. If your budget is tight, try and save money elsewhere in the kitchen. Choose a faucet that comes with a guarantee – this shows that the manufacturer is confident that its products will deliver for years to come.